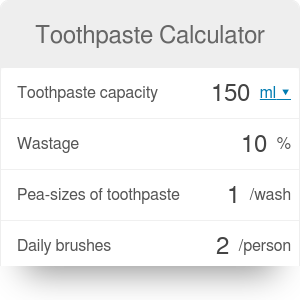 With our toothpaste calculator you can check a durability and cost of your toothpaste. Pea-sizes of toothpaste - 1 pea-size is the recommended amount of toothpaste you should use with every wash. Don't trust those commercials that suggest at least triple this - most stomatologists agree one pea-size is perfectly enough. That's it. The tool will instantly tell you how long the toothpaste will last for given the values you entered. Treat it as an approximate value of course but it should give you some general idea about the durability or the toothpaste and its cost. Toothpaste can be embedded on your website to enrich the content you wrote and make it easier for your visitors to understand your message.